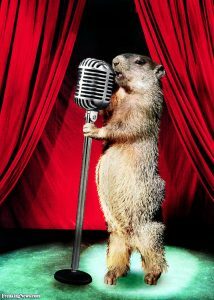 Saturday, February 2 is Groundhog Day. People across the U.S. and Canada will eagerly watch for groundhog Punxsutawney Phil’s prediction of the number of dark, winter days we have left. Rather than focus and long for those “lighter” days to come, this year’s Cabaret invites us to “Embrace the Dark.” Laura Brigham hosts the evening that starts at 7:00 p.m. Songs on the playlist include those that are light and funny and some that are dark and slightly creepy. Titles include: Poor Unfortunate Souls, Good and Evil, The Villain in My Own Story, All the Men in my Life Keep Getting Killed by Candarian Demons and more! It will be an evening filled with laughter and wonderful entertainment. Entertainers for the evening include talented local performers and visiting professionals. They are Laura Brigham, Lillian Deering, Andrew Ferguson, Adam Gardner, Christian Heintzelman, Danessa Hellus, Claudia Marsh, Kristie Moe, Sherri Mullen, Hannah Nelson, Sophia Rizzo, Natalie Slawnyk, Sarah Smith, Erica Tatum, and Mike Wisnewski. Accompanist: Jantz Black. Admission is $12 prepaid or $15 at the door. Reserve your tickets by calling 989-837-1885 or online at www.becreative360.org. Bring your own beverage.